The sirtuin SIRT1, a class III NAD(+)-dependent protein histone deacetylase, is present throughout the body that involves cells of the central nervous system, immune system, cardiovascular system, and the musculoskeletal system. SIRT1 has broad biological effects that affect cellular metabolism as well as cellular survival and longevity that can impact both acute and chronic disease processes that involve neurodegenerative disease, diabetes mellitus, cardiovascular disease, and cancer. Given the intricate relationship SIRT1 holds with a host of signal transduction pathways ranging from transcription factors, such as forkhead, to cytokines and growth factors, such as erythropoietin, it becomes critical to elucidate the cellular pathways of SIRT1 to safely and effectively develop and translate novel avenues of treatment for multiple disease entities. The protein capsid L1 of the human papilloma virus (HPV) - a key factor in the cervical carcinogenesis - is considered, together with p16, EGFR and COX-2, a characteristic marker for the evaluation of the malignancy progression and prognostic, in terms of tumoral aggressiveness. The purpose of the present study was to make a comparative assessment between the immunohistochemical pattern of p16, EGFR and COX-2 and immunochemical expression of L1 HPV capsid protein, in low grade and high-grade cervical squamous intraepithelial lesions, in order to determine the relationship of these tumoral markers with the infection status of HPV, and their practical applicability in patients diagnosis and follow-up. The study group included 50 women with cytological and histopathological confirmed LSIL (low grade SIL) and HSIL (high-grade SIL). The immunoexpression of L1 HPV protein was assessed on conventional cervico-vaginal smears and EGFR, COX-2 and p16 were immunohistochemically evaluated on the corresponding cervical biopsies. From all cervical smears, the HPV L1 capsid protein was expressed in 52% of LSIL and 23% of HSIL. From all cervical biopsies, p16 was positive in 64% of LSIL, 82% of CIN2 and 100% of CIN3, EGFR was overexpressed in 67% of HSIL (56% CIN2 and 43% CIN3) and 32% LSIL. For COX-2, the Allred score was higher in HSIL when compared to LSIL. Our data revealed 33 cases belonging to both LSIL and HSIL categories with the same Allred score. Immunochemical detection of L1 capsid protein, on cervico-vaginal smears, indicates an immune status induced by the HPV infection and may offer prognosis information, mainly in LSIL lesions. The assessment of p16, EGFR, and COX-2 allows to an integrative approach for the progression of squamous intraepithelial lesion, associated or not with the HPV infection. Prostate cancer represents the first leading cause of cancer among western male population, with different clinical behavior ranging from indolent to metastatic disease. Although many molecules and deregulated pathways are known, the molecular mechanisms involved in the development of prostate cancer are not fully understood. The aim of this study was to explore the molecular variation underlying the prostate cancer, based on microarray analysis and bioinformatics approaches. Normal and prostate cancer tissues were collected by macrodissection from prostatectomy pieces. All prostate cancer specimens used in our study were Gleason score 7. Gene expression microarray (Agilent Technologies) was used for Whole Human Genome evaluation. The bioinformatics and functional analysis were based on Limma and Ingenuity software. The microarray analysis identified 1119 differentially expressed genes between prostate cancer and normal prostate, which were up- or down-regulated at least 2-fold. P-values were adjusted for multiple testing using Benjamini-Hochberg method with a false discovery rate of 0.01. These genes were analyzed with Ingenuity Pathway Analysis software and were established 23 genetic networks. Our microarray results provide new information regarding the molecular networks in prostate cancer stratified as Gleason 7. These data highlighted gene expression profiles for better understanding of prostate cancer progression. Background: Ischemic stroke is a major health problem. Data regarding the possible association between ischemic stroke and the polymorphism of methylenetetrahydropholate reductase (MTHFR) C677T and A1298C are still conflictual. Aim: The study tried to assess the association of the two MTHFR polymorphisms with ischemic stroke in a series of patients from a unique hospital center. Materials and Methods: The study comprised a total of 127 patients (67 with non-cardioembolic ischemic stroke diagnosed by computed tomography or magnetic resonance imaging) and 60 control cases. The method we used was reverse hybridization performed on peripheral blood for C677T and A1298C polymorphisms. In all patients a careful clinical examination, laboratory analyses of cholesterol, glucose amount and triglycerides, as well as their medical history were available. Results: The mean age of stroke patients was 68.73 years, and 55.2% were males. Gene analysis for C677T disclosed the presence of TT genotype in more control subjects than in stroke series (15% and 7.46% respectively). Also, the overall T allele (CT+TT cases) was present in 71.6% of control cases, as compared with 44.7% stroke patients. 1298C allele was almost equally distributed among the two series. No statistically significant correlations of the two genotypes with infarct localization and dimensions ant with other potential risk factors (hypertension, lipids, diabetes mellitus) were observed. Conclusions: The two MTHFR polymorphisms, C677T and A1298C, seemed not related to the onset of ischemic stroke in our study. However, they could be rather involved in hemorrhagic stroke, as seen in our control patients. Further evaluation on larger series is mandatory since homocysteine activity (related to MTHFR activity) could be easily influenced by folate or cobalamin derivatives. Background: Elastography is an imaging technique, which displays the hardness of soft tissue, by showing the behavior of tissue when subjected to mechanical stress. The purpose of this study was to assess the role of ultrasound elastography in differential diagnosis of breast lesions. 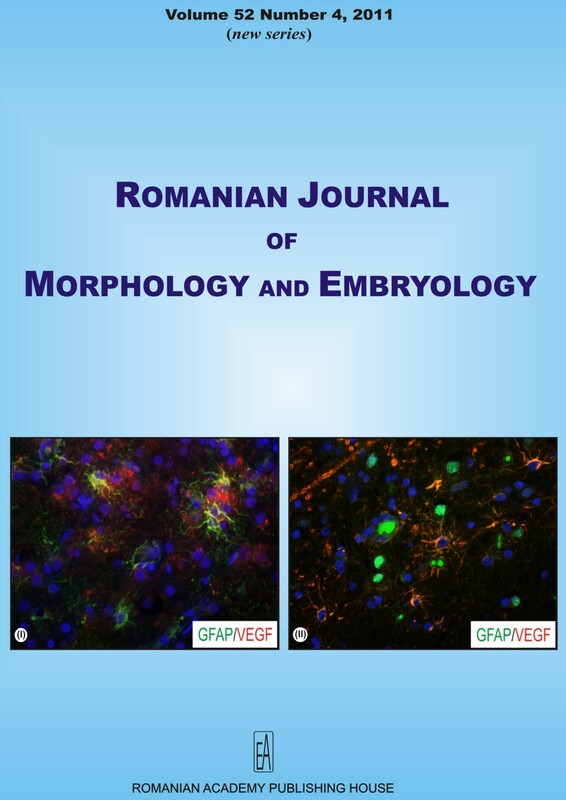 Materials and Methods: A prospective study was conducted in our Research Centre, University of Medicine and Pharmacy of Craiova. We introduced in this prospective study 215 patients diagnosed with breast lesions between January 2009 and January 2011. The patients were examined in the supine position and a ductal exploration was made over the breast. The final diagnose was cytology (FNA - fine needle aspiration), histology after excision or follow-up for six months. For obtaining the elastography images, we used a EUS Hitachi EUB 8500 and Siemens ultrasound systems with elastography modules incorporated. For assessment of ultrasound elastography role in differential diagnosis of breast lesions, we performed ROC analysis. Results: The elasticity score for benign lesions was on average 1.95+/-1.1, and for malignant lesions was 4.21+/-0.9. The mean diameter of malignant lesions was 27.3 mm, which was higher than the average diameter of benign lesions (19.9 mm). The most common histology of the benign nodules was fibroadenomas, cysts, and fibrocystic change. Of the malignant nodules, the most common lesion was infiltrative ductal carcinoma. We obtained a sensitivity of 85.3%, and a specificity of 90% (area under the ROC curve=0.908, 95%CI=0.856-0.945 and p=0.0001) when a cut-off point of 3 was used. Conclusions: Elastography is a method which can complement conventional ultrasound by improving the diagnostic performance. The introduction of ductal ultrasound combined with elastography increased the sensitivity and specificity, the radial technique allowing the precise localization of lesions regarding the breast gland. Prostate cancer (PCa) is the most frequent neoplasic condition in males, but only 64-65% of the cases are sensitive to hormone therapy. The aim of this study was to investigate the neuroendocrine component of the prostatic carcinoma, in relation to the histopathological form and the degree of differentiation. Biopsies were obtained through transurethral resection, from 82 patients with prostate cancer. In order to assess the histopathological form and the Gleason score, one section from each case was stained with Hematoxylin-Eosin. Additional sections were stained with chromogranin A. We considered neuroendocrine cell hyperplasia to have a higher value than that observed in benign prostatic hyperplasia (BPH) and normal prostate (over three neuroendocrine cells/gland). The quantification of neuroendocrine differentiation (NED) has been significant; the reaction was considered to be weak (2-10% neuroendocrine cells), moderate (10-20%) and intense (over 50%). Cells positive for chromogranin A have been identified in all the cases, but a larger number than that registered in normal tissue has been noted in 59 patients (71.95%). In most of the cases, the neuroendocrine cells have been distributed in small groups among the neoplasic cells, and rarely isolated. In two cases of small cell carcinoma most of the tumoral cells have been positive for chromogranin A. In conclusion, the study of neuroendocrine differentiation in patients with prostatic carcinoma revealed hyperplasia of positive chromogranin A cells, in 71.95% of cases. Neuroendocrine prostatic differentiation is correlated with the advanced stage of evolution and possibly with the resistance to hormonal treatment. In the last decade, it has been accepted the formation of tertiary lymphoid organs in the renal parenchyma during inflammatory conditions. These organized cellular aggregates contain B- and T-lymphocytes, dendritic cells, surrounded by neo-lymphatic vessels. They have been described in renal allografts, acute and chronic interstitial nephritis, IgA and membranous nephropathies. The functional characteristics of these lymphoid nodules remained still under consideration. After investigating the renal biopsies of 268 patients with primary and secondary nephropathies, we have selected 20 cases showing lymphoid-like cellular aggregates located just beneath the renal capsule and having close contacts with this kidney envelope. All of these cases also showed an associated medium sized lymphatic vessel. The ultrastructure of these nodules proved to contain more or less the same cellular composition: lymphocytes, dendritic cells, seldom plasma cells and macrophages. We consider these particular subcapsular lymphoid-like nodules to be tertiary lymphatic structures in close association with the perirenal lymphatics, and the first to develop in any type of inflammatory and autoimmune renal condition. More than 90% of malignant neoplasms of the oral cavity are squamous carcinomas of oral mucosa and most are conventional type. This study included 60 cases of oral squamous carcinoma processed by usual histological technique and stained with Hematoxylin-Eosin and Alcian Blue-Safranin (Alcian Blue powder from Sigma Aldrich, code A5268-25G) and diagnosed in the Department of Pathology, University of Medicine and Pharmacy of Craiova. Double immunohistochemical (CD105-tryptase, VEGF-, VEGFR1-, VEGFR2-tryptase) or combined histochemical and immunohistochemical reactions (VEGF/ VEGFR1/ VEGFR2/Alcian Blue-Safranin) followed the particular morphological aspects of the mast cells, their relation with the blood vessels and the overlap signal of tryptase and Alcian Blue-Safranin/VEGF and its R1 and R2 receptors in mast cells. Immunostaining for VEGF and its R1 and R2 receptors was present both in tumor cells and mast cells. Double immunohistochemical-histochemical reactions allowed us angiogenic profiling the mast cells. The signal overlap was present for VEGF-, VEGFR1-, VEGFR2-tryptase intratumoral and tumor invasion front mast cells. Student's t-test for comparison of intratumoral and the invasion front MDM showed highly significant value (p=3.23 E-08). VEGF/ VEGFR1/ VEGFR2/Alcian Blue-Safranin revealed particular morphological aspects of mast cells, in with different morphology, shapes, sizes and degrees of degranulation. Statistical analysis showed a linear correlation between MDM and MVD inside the tumor (Pearson coefficient =0.47) and a weak linear correlation at the front of invasion (Pearson coefficient =0.19). This study has highlighted the importance of mast cells in the tumor growth of the oral squamous carcinomas, especially in terms of their proangiogenic profile (expression of VEGF and its R1 and R2 receptors). In addition, their quantification as MDM makes this parameter a useful prognostic marker. Background: Osteonecrosis of the jaws is increasing worldwide in patients treated with bisphosphonates. Study design: A retrospective review of 52 patients who were treated during 2007-2010 for bisphosphonate related maxillofacial symptoms of the jaws was conducted. Patient characteristics and other factors that influenced the disease process were studied. Results: Thirteen patients received bisphosphonates for the prevention or treatment of osteoporosis; 39 for preventing bone metastases from malignant tumors. Thirty-six patients were females (age range 32-87 years, median 64 years); 16 were males (age range 30-81 years, median 73.5 years). Bisphosphonate used was ibandronic acid in four cases, alendronate sodium in 14 cases, and zoledronic acid in 34 cases. Mean bisphosphonate treatment period was 22.44 months (95%CI 19.33-25.55). Thirty patients received intravenous, 22 received oral bisphosphonate. The average period until occurrence of maxillofacial symptoms was 6 months (range 0.5-24 months) in subjects with intravenous bisphosphonate and 12.26 months (range 0.25-36 months) in subjects with oral bisphosphonates (p=0.011). Conclusions: The risk of bisphosphonate related osteonecrosis of the jaws is very high twelve months after oral administration and six months after intravenous administration in patients who have a trigger point in the jaws area. A proper monitoring of patients receiving bisphosphonates can reduce the risk of osteonecrosis and can prevent complications. Background: Recent advances have suggested that periodontitis (PD), the paradigm of chronic infection in dental pathology, shares several pathogenic pathways with cardio- and cerebro-vascular disorders (CVD), based on inflammatory mediators including IL-1, IL-6, TNF-alpha. Aim: To assess pro-inflammatory biomarkers (C-reactive protein - CRP, IL-6) in serum and gingival crevicular fluid (GCF) in patients with PD and with transient ischemic attacks (TIAs). Materials and Methods: Prospective observational study on 143 patients classified as follows: 40 healthy subjects (group A), 50 PD patients (group B) and 53 PD-TIAs patients (group C). The predefined assessment protocol has included: current medical data, risk factors for CRP changes, periodontal status (clinical, orthopantomography, Schei Ruler technique), inflammatory biomarkers (CRP, IL-6). Results: High serum CRP and IL-6 have been reported in both TIAs and PD, while statistically significant increase in GCF CRP only in PD-TIAs (p<0.05). Moreover, both generalized and localized chronic PD may be at higher risk for CVD, since CRP level was higher in these subgroups. However, no significant differences were reported in serum IL-6 between generalized and localized PD. A score function was demonstrated, including bone loss degree, bleeding index, collection site depth, serum and GCF IL-6 and CRP, tooth loss, allowing the classification of PD based on risk for developing TIAs. Conclusions: CRP and IL-6 are commonly involved in the pathways of PD and TIAs. Interdisciplinary assessment should be promoted in order to implement the stratification of PD patients according to the risk for TIAs as suggested by the proposed algorithm. Stroke is an important public health issue because it has high morbidity and mortality rates. In addition, it has one of the highest rates of disability in adults. Recent data show that macrophage system cells, especially microglial cells, are involved both in neuroprotective processes and in the neurotoxicity, depending on the type and extent of the brain damage. In our study, using histology and immunohistochemistry techniques, we evaluated the macrophage-type cell reaction in cerebral hemorrhage. We found that the number of CD68-positive cells increased 7-8 folds per square millimeter of cortical surface in the cerebral parenchyma adjacent to the hemorrhage. We identified a large number of perivascular-activated macrophages, in areas distant to the hemorrhage, showing that individuals with hemorrhagic stroke have profound and extensive alterations of the blood-brain barrier. In this in vitro study, examination of the morphological changes of enamel surface after topical application of a sodium fluoride solution was performed. Validation of the Fluorostom effectiveness became possible, after 10 years of using for the caries prevention national program. Materials and Methods: Sound human enamel sections, ware treated with a 0.05% sodium fluoride solution. Demineralization areas were created with 37% phosphoric acid etching gel for 60 seconds. The demineralization areas were immersed in 100 mL of sodium fluoride solution, twice daily for 30 days. Surface examination was performed at scanning electron microscope and energy dispersion spectrometry. Results: Morphological appearance of fluoride deposits on the enamel surface revealed the presence of globular precipitates. EDX qualitative analysis revealed the presence of fluoride signals. Conclusions: Globular structures of amorphous CaF2 precipitates, which act as a fluoride reservoir, were observed on the enamel surface after action of Fluorostom, and it can be recommended to prevent and control tooth decay. A growing body of laboratory research has shown that pro-inflammatory cytokines can facilitate tumor growth and metastasis. Our goal was to quantify the expression of CCL18 and IL-6 in patients with breast cancer compared with benign breast tumors patients and healthy women, in order to evaluate if these cytokines could serve for breast cancer diagnosis and evaluation. We also correlated the cytokines level of expression with some clinical and pathological characteristics known as prognostic markers for breast cancer. Plasma samples were obtained before treatment from 58 breast cancers, 41 benign breast tumors and 30 healthy women. The quantitative dosage was performed using ELISA. Wilcoxon test was used to compare groups. IL-6 and CCL18 were dramatically upregulated in breast cancers in comparison with healthy controls, but in comparison with benign tumors only CCL18/PARC was overexpressed at borderline significance in cancers (p=0.05). The plasma from benign breast tumor patients exhibited also significant higher levels of the two cytokines than normal controls. The cytokines profile was not linked to patient age, tumor size, histopathological type, lymph node status or histological grade. IL-6 was significantly upregulated in ER-positive and metastasized cancers. CCL18/PARC presented a significantly higher expression in advanced stage and highly proliferative carcinomas. In summary, IL-6 and CCL18 could clearly distinguish between women with breast cancers and healthy controls. High expression of IL-6 seems to confer a poor prognosis for ER-positive cancers. CCL18 was associated with worse prognosis parameters like high Ki67. Vascular endothelial growth factor (VEGF) is considered one of the main molecules involved in tumor angiogenesis and is largely expressed in oral squamous cell carcinoma (OSCC). His signal is transmitted intracellulary by binding with class III tyrosine kinase receptors, known as VEGF receptor family (VEGFRs). Therefore, we designed this study for quantification of VEGFR1 and VEGFR2 immunohistochemical expression in the tumor cells of OSCC, and compare this expression with clinicopathologic parameters. For this purpose, 46 formalin-fixed, paraffin-embedded tissue blocks of OSCC were processed by immunohistochemistry. The immunohistochemical signal was assessed by estimating the area of the objects and the medium pixel intensity per object, as the integrated optical density (IOD). In our study, VEGFR1 staining intensity was significantly higher for tongue localization, while VEGFR2 was higher for the lip. Both markers were higher expressed in the center of the tumor compared to the tumor front. Moderate differentiated tumors exert higher expression levels for VEGFR1 but lower for VEGFR2. pT1 tumors had higher VEGFR1 levels, and when lymph node involvement was present, this was accompanied by elevated expression levels for VEGFR2 and lower levels for VEGFR1. These results point to an inverse profile of these receptors in OSCC, suggesting their involvement in a sequential manner in VEGF signaling regulation. In conclusion, our study revealed that VEGFR1 and VEGFR2 correlate with tumor localization, tumoral area (front vs. center of the tumor), histological differentiation degree, and lymph node involvement, while only VEGFR1 correlated with pT stage. Purpose: The gangliosides overexpression contributes to the development of skin melanoma. The purpose of this study was to determine if the total gangliosides serum levels might predict the tumor growth in patients with melanoma or if the transfer of shed cell gangliosides reflects the implication in the clinical prognostic of these patients. Patients and Methods: Total gangliosides serum levels were measured in the cryopreserved serum by estimating lipid-associated sialic acid in 761 patients before surgical resection of melanoma, in 406 patients with precancerous pigmentary lesions, and in 410 healthy individuals. This study was performed at the Dermatovenereological Research Center, Bucharest, Romania, during 1991-2010. All sera obtained after surgical resection of melanocytic tumors were analyzed to see if adjuvant therapy (chemo-, immuno-, immunochemo-therapy) induced gangliosides changes in melanoma patients and if the responses were correlated with survival. Results: Total gangliosides serum levels were higher in melanoma patients than in precancerous melanocytic lesions patients or in healthy individuals. Larger tumors in Breslow index and more advanced stage of disease were correlated with higher total gangliosides serum values. Augmented total gangliosides serum levels after melanoma adjuvant treatment were predictive for decreased overall survival, whereas decreased total gangliosides serum levels were predictable for improved overall survival. Conclusions: A marker for early melanoma complications and survival may be the total gangliosides serum level. Ischemic stroke is the third most common cause of death in humans, requiring further studies to elucidate its pathophysiological background. One potential mechanism to increase oxygen delivery to the affected tissue is induction of angiogenesis. The most potent proangiogenic factor is VEGF. For this reason, our study investigated immunohistochemically VEGF reactivity in different cellular brain compartments from 15 ischemic stroke patients, as well as from 2 age control cases. By enzymatic immunohistochemistry, we investigate VEGF expression in different brain cell compartments and then we quantified its signal intensity by assessing integrated optical densities (IOD). To establish the exact cellular brain topography of VEGF immunoreactivity we performed double fluorescent immunohistochemistry series (VEGF/NeuN, GFAP, CD68, CD105). In control samples, VEGF reactivity was observed especially in neurons from the Brodmann cortical layers IV to VI and in protoplasmic astrocytes from the deeper layers of gray matter and in endothelial cells from normal blood vessels because of systemic hypoxia generated after death. In acute ischemic stroke samples, this reactivity was noticed in all brain cellular compartments but with different intensities. The most reactive compartment was the neurons, the intensity of VEGF reaction decreasing with the lesional age from the core infarct toward intact adjacent brain cortex. With a lower intensity, VEGF reaction was noticed in astrocytes compartments, especially in gemistocytic astrocytes adjacent to the liquefaction zone. We also noticed a weak reaction in activated non-phagocytic microglia from the periphery of liquefaction zones, and high VEGF-CD105 colocalization values at the level of microvessels that surround the infarcted brain area. In conclusion, this reactivity could suggest that VEGF might exhibit neuronal and glial protective effects and also a neoangiogenic property in acute ischemic stroke, facts that may have significant therapeutically impact on these patients. The aim of this study is to assess the histological changes in the sinus mucosa adjacent to the alloplastic material used for subantral augmentation. Materials and Methods: The study included ten sheep and a dog. The first group of five sheep underwent a sinus lift procedure, using PerioGlas as an augmentation material; the second similar group of sheep was the control group. The dog underwent a sinus lift procedure, with PerioGlas augmentation, after the sinus membrane was intentionally perforated and two implants were placed in the same operative step. Results: Scanning electron microscopy (SEM) of the sinus mucosa in the control group revealed cells without cilia between goblet cells. The cilia were uniformly arranged in sections in the same direction. Changes occurred in the sinus mucosa after grafting, such as drastic reduction of ciliated cells, which seemed to be replaced by goblet cells. In all sheep undergoing grafting, generalized fibrosis was found in the mucosal area that came into contact with PerioGlas. In two of the sheep in which grafting was performed, mucoid cysts with pseudo stratified ciliated epithelium were present. Even when the sinus mucosa was perforated (in the dog), the inflammatory process developed in the mucosa did not prevent the integration of the graft and implants. In conclusion, following the sinus lift procedure, changes occur in the sinus membrane to adapt to the new situation, without the appearance of chronic or acute suppurative processes. The aim of this research is to present the results of neuromuscular assessment using tensiomyography (TMG) in multiple sclerosis for prediction the muscle changes. This study consists of 20 patients, selected conform to certain criteria. Thus, according to diagnosis and MS level, the studied group was divided into two subgroups: subgroup A, consisting of 13 MS patients with clinically detectable gait disorders, and subgroup B, made up of seven MS patients without clinically detectable gait disorders. TMG determines the diagnosis of a certain muscular type and muscular status/condition (fatigue, stress influence on the body, etc. ), the diagnosis of a functional muscular symmetry. The investigation has been performed on the shank muscles. The parameters evaluated through TMG were: contraction time (Tc) and the amplitude of muscular displacement in transverse direction - Dm (mm) a parameter which is also correlated with Tc values and depends on the flexibility of muscular tissue. Results: Dm in the case of gastrocnemius muscles (mG) data analysis shows an evolution of functional bilateral right-left asymmetry, which is more pronounced in subgroup A. At the level of posterior shank, Dm values in subgroup A are lower, which means that patients in subgroup A have a higher muscular tone and a maximum response to stimulation. Concerning Tc values, this parameter indicates muscular fatigue at the level of anterior tibialis. Conclusions: TMG, besides classical methods of paraclinical investigation, improves data generation, standardization, identifies correlations, which may facilitate a precocious diagnosis in morphofunctional changes evolution at muscular level at MS patients. Aerobic life is connected with continuous production of free radicals, particularly reactive oxygen species (ROS). Cells posses an enzymatic and non-enzymatic antioxidant system to maintain redox homeostasis. Oxidant-antioxidant imbalance resulting in excessive accumulation of ROS is defined as oxidative stress. Oral lichen planus (OLP) is a chronic inflammation of unknown etiology. Several researchers suggest that oxidative stress is implicated in the pathogenesis of this disorder. The aim of this study was to evaluate the histopathological alterations and the status of local oxidative stress and antioxidant defense system in patients with OLP. We evaluated and compared the local levels of oxidative stress biomarkers malondialdehyde (MDA) and glutathione (GSH) in patients with OLP with that of normal controls. Increased levels of MDA and decreased levels of GSH suggest the idea of oxidative stress implication in the pathogenesis of oral lichen planus. Diabetes mellitus and periodontal disease are two pathological entities that destructively emphasize each other. The aim of our study was the histological and immunohistochemical analyze of the inflammatory infiltrate in the gingival tissue at patients with diabetes mellitus (DM) and periodontal disease. Materials and Methods: The study was achieved on gingival tissue from 40 patients with DM and specific symptoms of periodontal disease. We used Hematoxylin-Eosin and trichromic Goldner-Szekely staining and CD20cy and CD45RO antibodies. Results: In patients with DM under 10 years, we found an intense periodontal lymphocyte inflammatory infiltrate and in patients with a DM evolution more than 10 years, the lymphocyte inflammatory infiltrate had a less intensity. The pattern was mostly diffuse in lamina propria. Many patients had a very abundant plasmocyte infiltrate. During immunohistochemical exam, 25 cases presented CD20 positive immunostaining. The intensity of the inflammatory infiltrate with B-lymphocytes was very low (score 1). All immunohistochemical analyzed cases presented CD45RO positive immunostaining, with a mixed pattern of the T-cell lymphocyte infiltrate. Conclusions: The nflammatory infiltrate in diabetic periodontal disease was polymorph, mostly with a diffuse pattern in gingival chorion. The intensity of the lymphocyte infiltrate was higher in patients with chronic periodontitis and DM less than 10 years. Positive CD45RO T-lymphocytes were more numerous compared to positive CD20 B-lymphocytes and they were present intra and under epithelial in the gingival of all the patients, no matter of the DM time evolution. Warthin tumor is the second most common benign tumors of the parotid gland, after pleomorphic adenoma. Our study was performed on 21 cases with Warthin tumor diagnosed between 2005-2010, which were analyzed clinically, histologically and immunohistochemically, using anti-CD20 and anti-CD45RO antibodies. The analysis of age distribution within the investigated cases indicated that Warthin tumor incidence is increasing in the seventh decade of life, most patients being male (M/F 5/2). Histopathological, the analysis report of stroma/parenchyma in 14 cases revealed a balanced distribution of the two components, in four cases, the epithelial component was predominant and in three cases, the stromal component was predominant. Immunohistochemical study for the two specific lymphocyte proliferation markers indicated positivity for both epithelial component and stroma. Cell layout of CD45RO and CD20cy at the level of lymphoid stroma had a similar pattern with normal or reactive lymph nodes. Aim: Immunohistochemical evaluation of hormone receptors (ER, PR) and correlation of immunohistochemical and morpho-clinical data. Materials and Methods: The study was performed on paraffin-embedded and HE-stained tissues originating from 100 cases of invasive mammary carcinoma. Monoclonal antibodies, anti-estrogen and anti-progesterone receptors, were used for the immunohistochemical study. The detection system was EnVision HRP and the visualization system was 3,3'-diaminobenzidine tetrahydrochloride (DAB). The evaluation of the result was performed using the Allred score. Results: The majority of the studied cases (57%) expressed both types of hormone receptors and in 32% of the cases the hormone receptors were completely absent. The rest of the cases presented a heterogeneous phenotype: 7% presented the ER-/PR+ phenotype and 4% the ER+/PR- phenotype. Compared with the classical phenotype (ER+/PR-), ER+/PR- tumors were more frequent at patients over 50-year-old. The tumors with ER+/PR- were larger than the ER+/PR+ and they were of the invasive ductal carcinoma type with an Allred score for ER under 6. Conclusions: The predictive value is amplified when the ER status is correlated with the PR status because the heterogeneous phenotypes are identified, especially the ER+/PR- phenotype, which have an aggressive behavior and the lowest response to tamoxifen therapy. Chronic rhinosinusitis is a multifactorial disease with pathophysiological mechanisms, which remain unclear, and with a high prevalence worldwide. They generate social problems due to the high number of days of leave and relatively elevated medical expenses. The histopathological and immunohistochemical study that we conducted revealed many lesional aspects of the epithelium of the sinus mucosa, which ranged from hypertrophy, hyperplasia and metaplasia, to erosion and discontinuities. In the chorion of the sinus mucosa there was an inflammatory infiltrate composed mainly of lymphocytes, plasma cells and macrophages, and also a highly developed vascular network. Among immune cells, T-cells appeared to be more numerous than B-lymphocytes and macrophages. We believe that microscopic changes are due mainly to microscopic organisms that make up the biofilm of the sinus cavity, whose virulence has been more or less influenced by exogenous or endogenous factors. The aim of our study was to identify the most important anatomical landmarks in the cephalometric evaluation of Class III patients and to clarify the morphological characteristics of these cases. A group of 10 Class III orthodontic patients was evaluated in this study. The control group consisted of 10 patients with average occlusion and skeletal characteristics. Digital lateral cephalometric X-rays were performed and different measurements were analyzed. Cephalometric data were evaluated with the CephX specialized software for orthodontic diagnosis and the results were statistically analyzed. The Class III group presented specific characteristics such as prognathic mandible, large gonial angle, short maxillary length, higher lower facial height. These findings can be useful for the diagnosis and treatment planning of orthodontic cases with dental/skeletal anomalies, especially in cases when surgical approach is considered. The surgical decision must be taken after an accurate investigation of the lateral cephalometric parameters. Reduced cerebral blood flow beyond the compensatory mechanisms leads to cerebral hypoxia. Hypoxia causes various lesions of neurons, glial cells and cerebral blood vessels, depending on its duration and intensity. In our study, we reduced cerebral blood flow in the experience animal on average by 30%, by right internal carotid artery ligation. Fifteen days after the onset of hypoxia, by histology and immunohistochemical studies, we identified neuronal, glial and vascular damage. Lesions of nerve and glial cells ranged from changes of cytoplasmic tinting with the development of "red neurons", to neuronal and glial cytolysis with areas of focal necrosis. Vascular lesions were represented by the collapse, fragmentation and discontinuity of capillaries, always associated with a marked perivascular edema. We present the case of a 69-year-old Caucasian and non-smoker patient with erythematous, itchy, violaceous lesions on the ankles, wrists, lower legs, forearms and trunk developed within 15 months. Her condition was diagnosed as prurigo and she was treated for a long period of time with antihistaminic drugs, with no resolution of lesions. In October 2008, she presented to a Private Practice of Dermatology in Timisoara. The dermatologist noticed the development of violaceous lesions on her trunk. The patient had similar lesions on the ankles, wrists, lower legs, and forearms for the last eight months. At physical examination many hyperpigmented, 1 to 6 cm, thin plaques were present on the flanks, shoulders, and infra-mammary area. There was no vaginal involvement. This eruption had a good response to topical glucocorticoids, but recurred multiple times after discontinuation of treatment. A biopsy specimen showed some histopathological features of lichen planus. Gastrointestinal stromal tumors account for 0.1-3% of all gastrointestinal neoplasms and are characterized by features that overlap with those of other mesenchymal tumors. We expose the case of a 58-year-old male patient who complained of abdominal pain, weakness and melena. Microscopic examination of surgically resected gastric tumor revealed a neoplastic proliferation composed of spindle cells with eosinophilic cytoplasm, elongated nuclei with rounded ends, palisadic disposition and intracytoplasmic perinuclear vacuoles, low cyto-nuclear polymorphism, mild atypia and mitotic activity of 3-5/50 HPF. Some histopathological features requested differential diagnosis with schwannoma and tumors of myocytary origin, based on immunohistochemical techniques, which have established a final diagnosis of spindle cell gastric stromal tumor. We also reviewed the GIST-related literature and evaluated the possible methods of preoperative diagnosis of GISTs based on endoscopic biopsy. Proper classification of GISTs based on histopathological criteria and immunohistochemical techniques has a great prognostic and therapeutic utility. Future development of endoscopic biopsy methods will refine the management of gastrointestinal stromal tumors. The caecum and the ascending colon are the colon segments most frequently affected by tumoral synchronism. Synchronous colorectal carcinoma etiopathogenesis is complex and most likely by malignancy of preexisting adenomas (adenoma-adenocarcinoma sequence). The following tumoral synchronism clinical case's particularity is represented by the simultaneous diagnosis of a flat-type adenocarcinoma of the caecum (less common histopathological type) and of a mucinous adenocarcinoma on the ascending colon. Tumor profiles of both carcinomas were examined histologically and immunohistochemically, emphasizing: (1) tumor proliferation different histological type; (2) residual adenomas in the periphery of the flat-type adenocarcinoma; (3) hardly microscopic detectable invasive character of the flat-type carcinoma; (4) mucinous carcinoma's infiltrating character and its immunohistochemical phenotype; (5) both tumor aggressiveness. The diffuse neurofibroma is an uncommon subtype of neurofibroma that has received little attention in the imaging literature. Most common in ages 10-30, in males and females, with a slight predilection for the trunk, then head and neck, then limbs. May become very large, but very rarely undergo malignant transformation. Treatment of diffuse neurofibromas (not associated with NF1) is often surgical resection. Complete resection is often difficult because of the extensive and infiltrative nature of many of these lesions. To our knowledge, the diffuse neurofibroma has been reported extremely rarely within the shoulder girdle. In this report, we presented an adult patient, without NF1 diagnosed, who developed invalidate status of left upper limb due to a giant diffuse neurofibroma involving the left brachial plexus, with a high growth diffuse pattern and plexiform architecture imagistic, grossly and without results at both surgical interventions. The diagnosed was by MRI and sonographic imaging and histopathologic examination. His immediately survival perspective was not affected but the functionality of the left upper limb was severe reduced. The main classical branches of celiac trunk (CT) are the common hepatic artery (CHA), the left gastric artery (LGA) and the splenic artery (SA). During the educational dissections in a 62-year-old male cadaver a rare variation, the gastroduodenal-splenic trunk (GDST), was observed. GDST divided into SA and gastroduodenal artery (GDA). LGA and accessory left hepatic artery (ALHA) arose directly from the abdominal aorta (AA). Therefore, variations of CT are important for the clinical diagnosis and therapy. The possible variations of anatomical and morphological characteristics of the teeth are very important especially for the endodontic practitioner. Before beginning any kind of endodontic treatment, the clinician must be always take into account the morphological variations in pulp anatomy. Among all human teeth, the mandibular first permanent molar is one of the most important. It is often affected by caries and usually needs root canal treatment, even at an early age. For the success of its endocanalicular treatment, dentists need to locate all root canals, debride them entirely, and after that fill the whole endocanalicular system with an inert root filling material. Unfilled canals, left like this because they were not detected, can compromise the longevity of the tooth, thus being a source of infection and a main cause of failure of the prosthetic treatment. This article presents two clinical cases of right mandibular first molars with two roots and four canals instead of three.